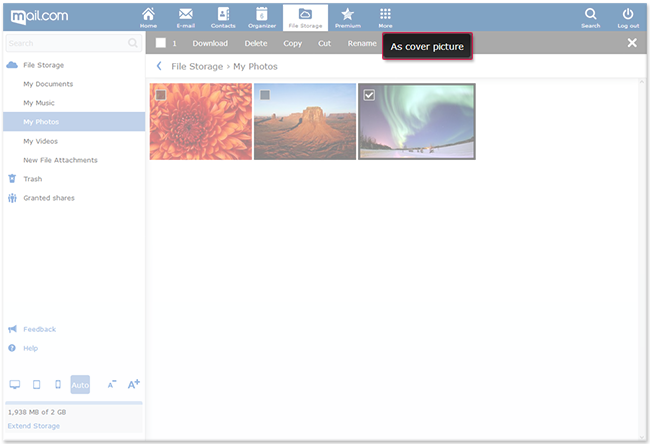 If you want to grasp the content of a folder in your File Storage at a glance, you can define a preview picture for a single folder. You can define a photo as the preview picture, which will then appear in the folder view. The preview picture is only shown if you have selected the thumbnail gallery view in the upper right corner. Open the folder you want to assign a preview picture for. Click the photo you want to assign as the preview picture. In the Actions menu, click As cover picture. The photo is displayed in the folder view as the preview picture.